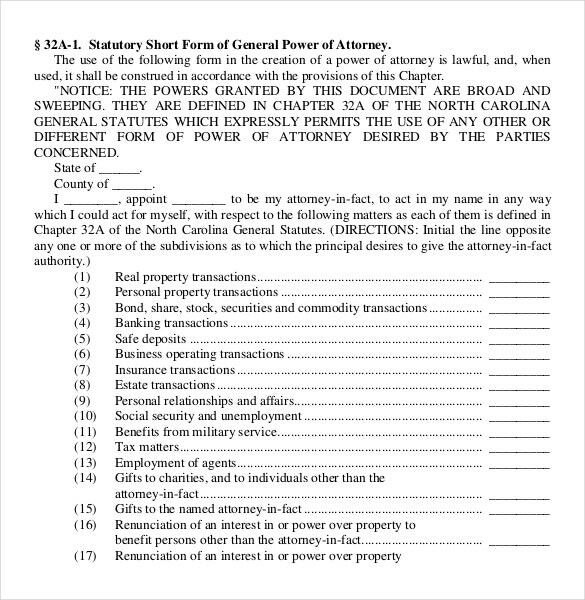 A power of attorney is often abbreviated as POA. It is a written document or a written authorization, which gives one the right to act on behalf of another person in all legal matters including business, private affairs and other matter. It is not necessary that power of attorney will be granted with the permission of the person in concern. More often than not, it is without his will. You may also see Word Power of Attorney Templates. Power of attorney being a written document is legally binding, and the person being given the right is free to take any decision that he thinks is necessary. This is usually done when a particular person is not seen fit to take important decisions, or is incapacitated. The person being granted the right to take out necessary action is the agent, which is only right, since he is acting on behalf of someone. Non-durable power of attorney templates are documents which guarantee the agent to act on behalf of someone for a specific duration of time. For example, it could be one particular transaction for which the agent is taking decisions on behalf of the person concerned. The durable power of attorney is more encompassing and comprehensive than the non-durable one. It does not have a specific time limit, and gives the agent complete control over all affairs of the person. As soon as the durable power of attorney template is signed upon the inability of the person to take decisions for himself, the agent is authorized to carry out his duties. 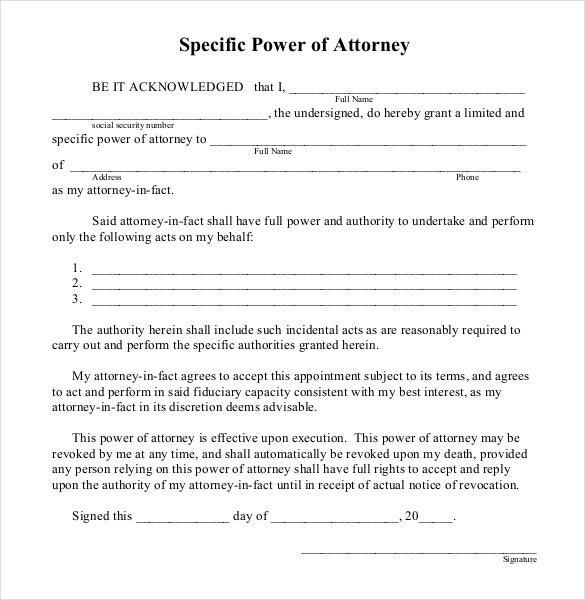 The special power of attorney is in may ways similar to the non-durable power of attorney. In this case, the agent is given the permission to carry out a particular task or take a decision foe one transaction and one transaction only. In such cases, special power of attorney templates may be used. 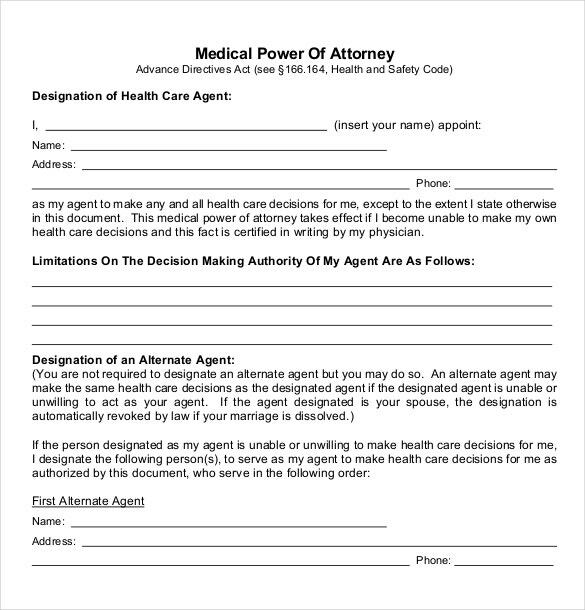 Medical power of attorney is given to an agent when someone is incapable of taking medical decisions for himself. After the consent of the physician has been given, this agent can take all health care related decisions. A springing power of attorney template is to be used in the future when a particular incident that has been apprehended takes place later on. 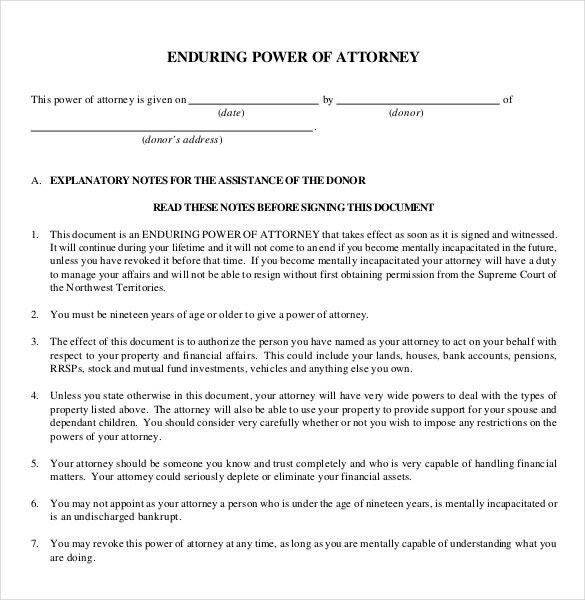 > Why Should You Use Power of Attorney Templates? Power of attorney is a legally binding document which has a very specific format. It has a pattern which must be closely followed by you. You cannot afford to make mistakes, or miss out details in a document as important as the power of attorney. In such cases, it is always better to refer to power of attorney template examples. You can look up these examples and follow the patterns in them. All you have to do is edit a few things here and there and you’ll be good to go. A document like power of attorney usually needs to be created within a fixed span of time and is a matter of urgency. In such emergency situations you will not have the time to draw up a document all by yourself. 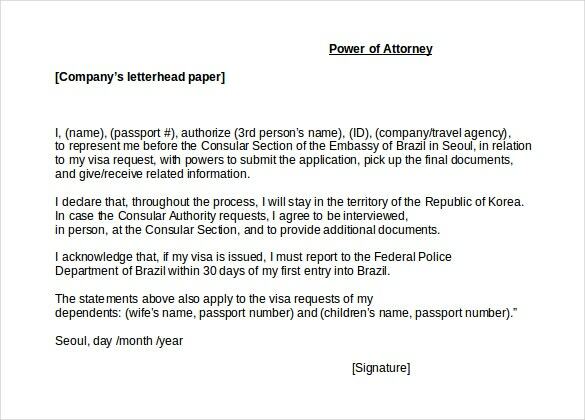 That is why you need Power of Attorney Template online, you can edit and start using them as soon as you download them. 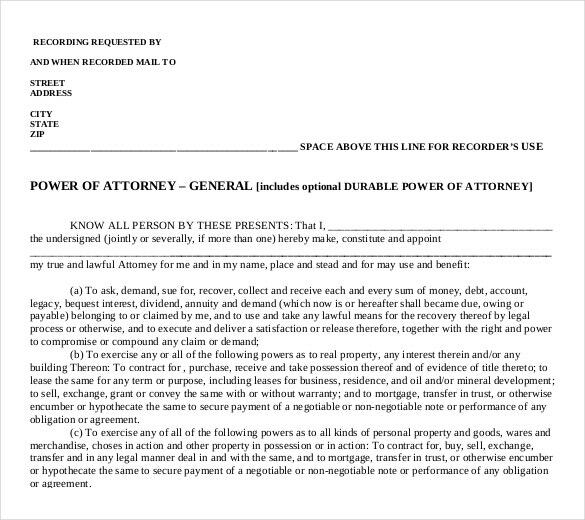 > How To Create Power of Attorney Documents Using Templates? If you’re planning to download power of attorney templates, you need to understand how to use them. First, you must download the correct template based on the purpose. 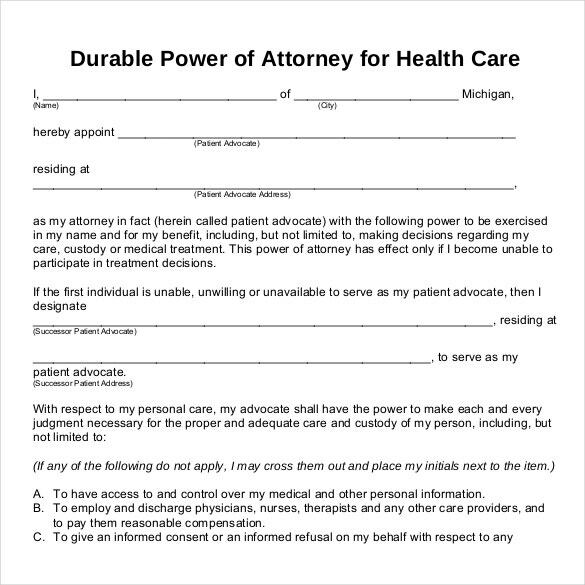 For example, for the medical power of attorney, special templates are available for you. Once you’ve downloaded the template, you can start by editing the terms and conditions of the power of attorney. Of course, the terms mentioned in the Word Templates won’t match the ones decided upon by you. After editing it, all you have to do is print the document and ge it signed! 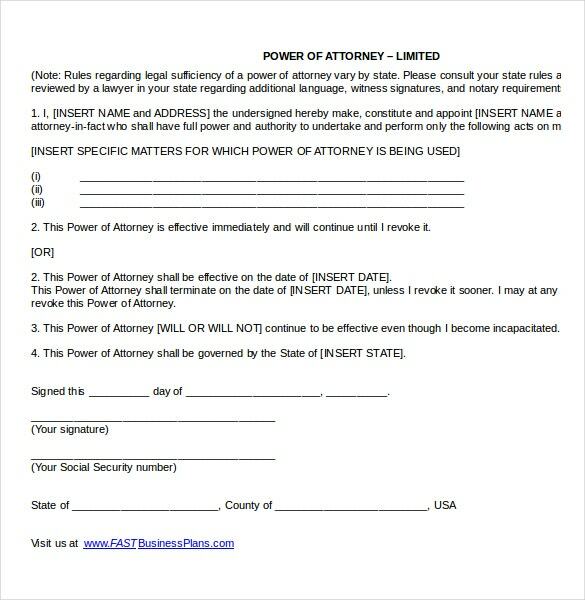 There, you now have your power of attorney! It really is as simple as that. First, you must take into consideration the type of power of attorney. The purpose will determine the kind of template and the kind of terms and conditions. If you download the wrong template, you could mess up the whole document and you’re bound to make mistakes. Narrow down your search on the basis of the purpose. 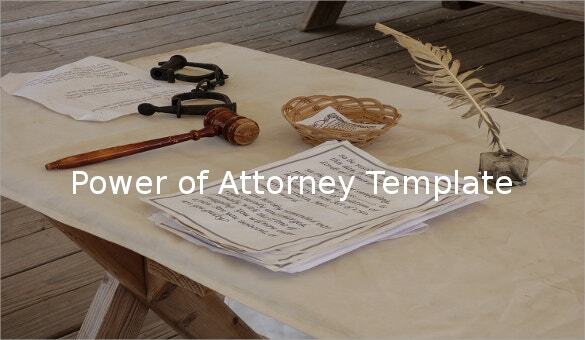 The language of the power of attorney template should be formal and professional. It is a legal document, after all. All the points need to be listed in an orderly fashion, preferably in bullets or numbered lists. The points need to be simple, precise and to the point. Crisp and concise language is preferred in the case of power of attorney. Make sure you have a thorough knowledge of the law regarding that particular issue. If you don’t, take the advice of someone who does. 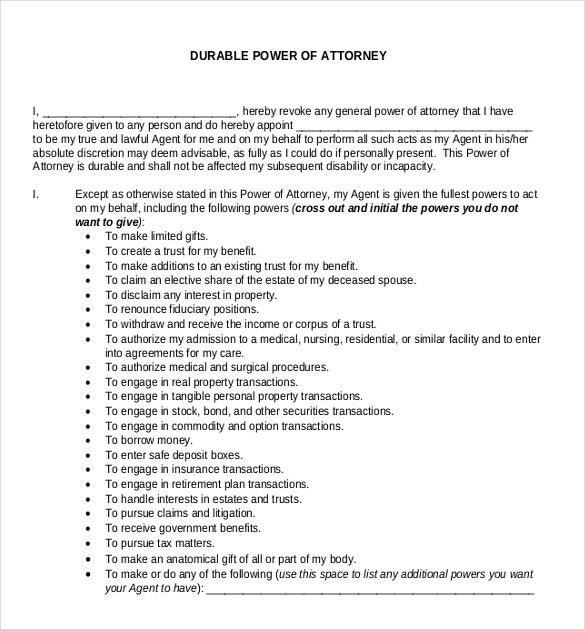 Only based on this can you proceed with the power of attorney. Remember, this is not a matter of joke, but an extremely grave situation. Do not forget to mention any details that might be important. Check and recheck before finalizing the document. You can even create a rough draft beforehand. Jot down all the points in the rough draft, and after you’ve finalized it you can start working on the actual document Also see Microsoft Templates. Mention the names of the persons in question. Try to keep the as simple and minimalistic as possible. Use simple language while writing. Do not add unnecessary details. A power of attorney document is usually drawn up by a lawyer, or a person with some knowledge of the law. 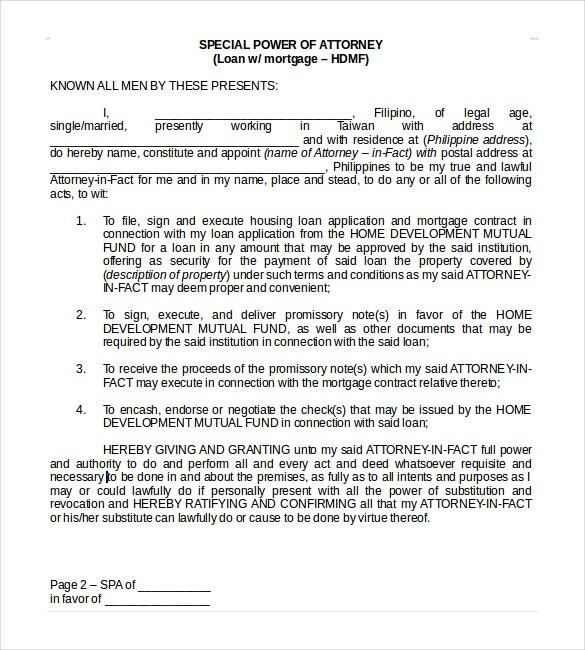 This document has to be signed by the agent and the grantor in order to seal the deal. The written letter states all the terms and conditions associated with such an extraordinary situation, and states the extent to which the agent can exercise his right. If you’ve never Make a lasting Power of Attorney before, you need to look up power of attorney templates online. At template.net, we have an endless collection of free power of attorney templates. Our templates have been crafted by people who have expertise in the field of power of attorney. We have different kinds of templates available for you, depending upon the various purposes they serve. You can look up the best power of attorney templates on template.net, and we assure you, you won’t be disappointed. If you have any DMCA issues on this post, please contact us!